If Macy’s is the Marcia Brady of department-store Christmas windows, then Barneys New York must surely be the criminally overlooked—at least by non-fashion types—Jan. But what the Barneys holiday display lacks in cachet, it more than makes up in wit and verve under the discerning eye of Simon Doonan, the luxury retailer’s creative director. (Last year’s visual spread celebrated 35 years of Saturday Night Live.) For 2010, Barneys is toasting to a “foodie holiday,” sheltering not only caricatures of famous chefs in its Madison Ave. flagship windows, but also “Miss Illy,” a mannequin dressed to thrill in a voluminous gown assembled from recycled espresso foil bags. Doonan salvaged hundreds of foil perEspresso bags, then crimped and pleated them to create the gown. 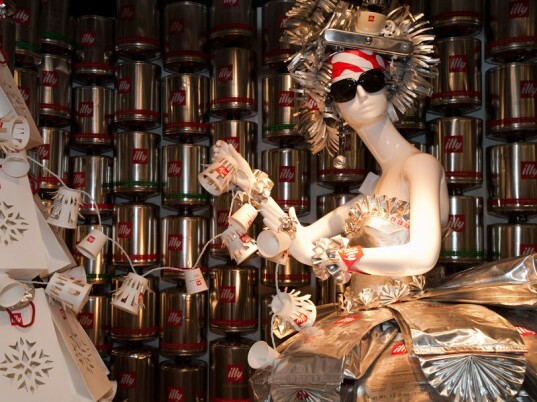 To dress Miss Illy, Doonan and his staff salvaged hundreds of foil perEspresso capsule bags, then crimped, pleated, and pierced them to create the bodice and skirt. “We were going to call her Contessa Caffeina,” Doonan tells T Magazine, “but we decided she’s no Italian aristocrat, she’s a nice Jersey girl.” The windows will be formally unveiled on November 16. If Macy's is the Marcia Brady of department-store Christmas windows, then Barneys New York must surely be the criminally overlooked�at least by non-fashion types�Jan. But what the Barneys holiday display lacks in cachet, it more than makes up in wit and verve under the discerning eye of Simon Doonan, the luxury retailer's creative director. (Last year's visual spread celebrated 35 years of Saturday Night Live.) 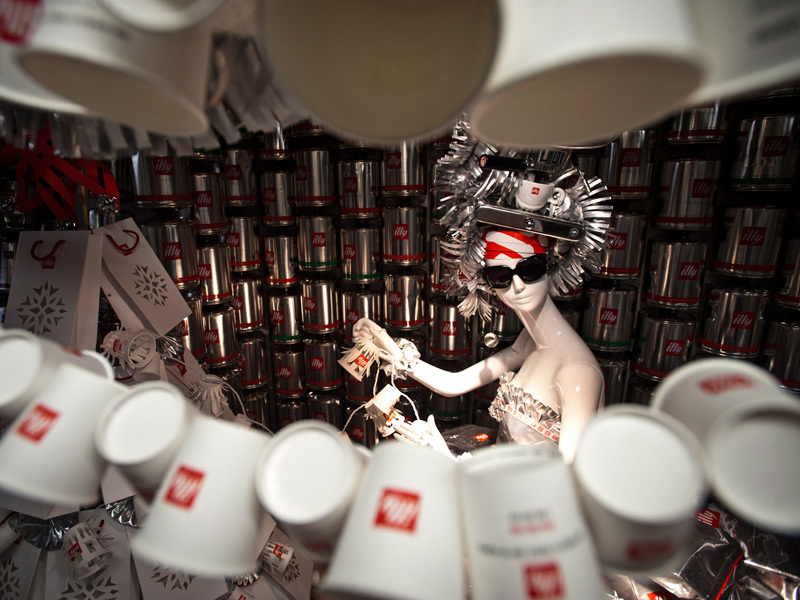 For 2010, Barneys is toasting to a "foodie holiday," sheltering not only caricatures of famous chefs in its Madison Ave. flagship windows, but also "Miss Illy," a mannequin dressed to thrill in a voluminous gown assembled from recycled espresso foil bags.